Things got way out of hand after UFC 229 earlier this month (Sat. October 6, 2018). UFC lightweight champion Khabib Nurmagomedov successfully defended his title against Conor McGregor. “The Eagle” submitted the Irishman via fourth-round neck crank. After the fight, however, madness erupted. 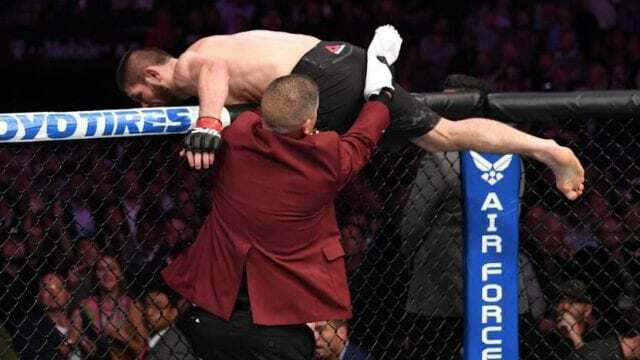 Khabib, who was allegedly heckled by McGregor cornerman Dillon Danis, hopped the Octagon and went after the jiu-jitsu specialist. They began to brawl outside the Octagon, sparking another melee inside the cage. A few of Khabib’s teammates entered the cage and attacked McGregor. “The Notorious” ate a few sucker punches before the commission was able to get the situation under control. Both McGregor and Khabib are facing complaints from the Nevada State Athletic Commission (NSAC). Many people are pointing the finger at Khabib for losing his composure and sparking the entire ordeal by hopping the cage. 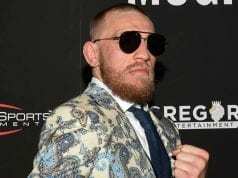 However, many are also failing to realize the verbal onslaught he had to endure from McGregor in the lead-up to the contest. McGregor insulted Khabib’s country, family, and religion. Danis’ alleged antics were apparently the straw that broke the camel’s back. Speaking to Submission Radio recently, mixed martial arts (MMA) legend Bas Rutten offered his thoughts on the matter. “Okay, first, let’s say this, it shouldn’t have happened, it’s wrong. I know that it’s all wrong. It should not have happened, I’m not for it. Not at all. But I can totally get it, right? We’re all human. He’s been taking insults for the last six weeks, two months, every day. Every day he decided not to say anything back. “Then, everything came back – all the insults about his family, about his religion, about his country. You know, there’s a lot of things (Conor said). And everybody says the same thing, but people go, ‘come on, Bas, you can understand it?’ I say, you can’t understand that? Of course I can understand. Everybody’s human. Rutten reinforced his belief that the melee should never have happened. He wanted people to remember, however, that McGregor did something similar before UFC 223, so his fans should maybe lighten up in Khabib. “And then when the moment presents itself and they keep on going after it, yeah, I can completely understand it. Should it have ever happened? Of course not, I’m not for it. I’m not saying it’s good. Absolutely not. But I can understand it happened. That’s the only thing I’m saying. Well, I said the same thing when Conor went wrong (at UFC 223), right?